Tucson, AZ, June 13, 2013 --(PR.com)-- Geoff Notkin, star of TV’s Meteorite Men, is following up a stellar appearance at Spacefest V over Memorial Day weekend with two special events in Arizona during the month of June. Notkin was one of the most in-demand celebrities at Spacefest V, an annual gathering of renowned astronauts, scientists and space artists held in Tucson, Arizona. During the event, he joined a panel discussion on the topic of asteroids; was a featured guest speaker in the conference’s Big Room; participated in SpaceUp Paris, hosted at the European Space Agency (ESA) headquarters; and conducted numerous meet-and-greets and book signings with fans from around the world. Notkin’s presentation on meteorites and the making of Meteorite Men was one of the most widely attended of the four-day event and the only one to extend into overtime, by popular demand. On the heels of Spacefest, Notkin is heading to Challenger Space Center Arizona, where he is scheduled to appear on Friday, June 21. Beginning at 2:30 p.m. in the Space Center rotunda, he will provide an entertaining presentation entitled, “Meteorites. Visitors from deep space. How do we find them, against all odds?" The talk will be followed by a question-and-answer session with the audience. The event is free for children participating in Challenger Space Center’s “Adventures in Space” summer camp. Members of the general public are welcome to attend with paid general admission. Preregistration is required; visit www.azchallenger.org to register. A book signing at Challenger Space Center will follow at approximately 3:45 p.m. for anyone who purchases one of Notkin’s books -- the award-winning, “Meteorite Hunting: How to Find Treasure From Space,” or his recent memoir, “Rock Star: Adventures of a Meteorite Man.” Both are available in the space center’s gift shop with proceeds benefiting Challenger’s STEM education programs. That same evening, Notkin will appear at an invitation-only reception for Friends of Challenger Space Center, where he will present a behind-the-scenes tour of his popular exhibit, “They Came From Outer Space,” featuring meteorites, costumes, props, and equipment from his personal collection and the Meteorite Men TV show. He will also be adding three rare meteorite specimens to the exhibit: A piece of the famous Chelyabinsk meteorite, which made headlines worldwide when it slammed into Russia in February of this year, as well as small slices of meteorites that were originally part of the Moon and Mars. The public is invited to see these amazing new exhibit pieces beginning Saturday, June 22. The exhibit is open daily from 10 a.m. to 4 p.m. and is free with paid general admission to the Center. On Saturday, June 22, Geoff heads to Lowell Observatory in Flagstaff, where he will participate in the grand opening of the Observatory’s new exhibit, “Great Balls of Fire: Comets, Meteors, Asteroids.” At 7:00 p.m., Notkin will share his adventures as a meteorite hunter during a 30-minute indoor presentation, followed by a book signing. The special event, which is included with regular admission fees to the Observatory, also feature hands-on activities and telescopes set up for viewing celestial objects in the evening. Visit www.lowell.edu for more information. 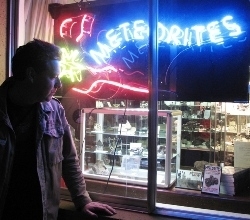 Notkin recently announced that his personal memoir, “Rock Star: Adventures of a Meteorite Man,” is in the early stages of screenplay development for a movie based on his extraordinary life as a punk rock musician, adventurer, and world-renowned meteorite hunter. Featuring an introduction by Neil Gaiman, the book has been praised as “a fantastic blend of adventure story, meteorites, rock 'n' roll, and everything else that's fun in life” (Astronomy Magazine). Additional details on the screenplay adaptation will be forthcoming as soon as they are available. The book is available for purchase at www.meteoritehunters.tv. Media wishing to interview Geoff Notkin, either in person at the above events or via prior arrangement, are asked to contact Becca Gladden, Public Relations Director, at limelightwriting@aol.com. About Geoff Notkin: A television host, professional meteorite hunter, science writer, photographer, and owner of Aerolite Meteorites, Geoff stars on Science Channel's award-winning TV show Meteorite Men. He has also made documentaries for National Geographic, Discovery, PBS, BBC, History Channel, A&E, and Travel Channel and has written more than 150 published articles on meteoritics, paleontology, adventure travel, history, and the arts. The minor planet 132904, discovered at Mount Palomar, was named "Notkin" and approved by the Minor Planet Center in recognition of Geoffrey's contributions to science and education.